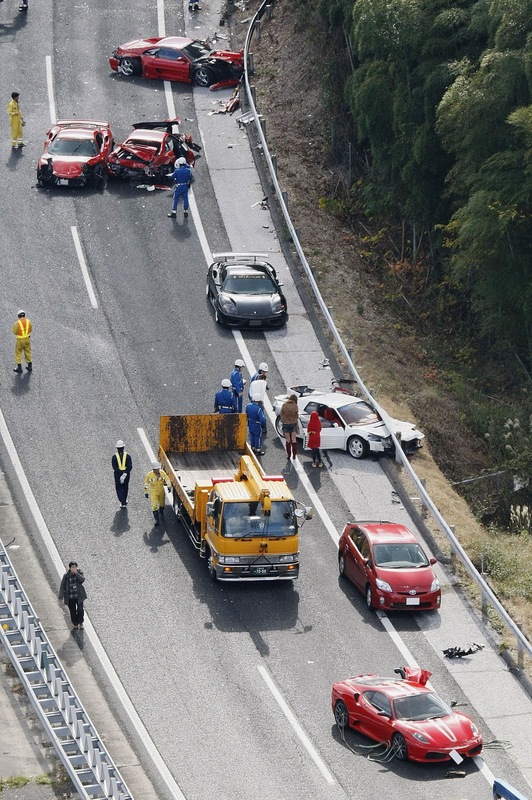 An outing of luxury sportscar enthusiasts in Japan ended in an expensive freeway pileup — smashing a stunning eight Ferraris, a Lamborghini and two Mercedes likely worth more than $1 million together. Police say they believe the accident Sunday was touched off when the driver of one of the Ferraris tried to change lanes and hit the median barrier. He spun across the freeway, the other cars collided trying to avoid hitting his car. Video of the crash aired by NTV, a major national network, showed several smashed, bright red Ferraris cluttering the freeway. Even a used Ferrari in Japan can fetch $100,000 or more, meaning the total damage may be $1 million or more. Police declined to comment on the total amount of damage, but said some of the vehicles were beyond repair. NTV quoted the driver of one of the tow trucks brought in to clear the scene as saying it was the most expensive crash site he had ever seen. No one was seriously injured, but police in Yamaguchi prefecture said 10 people were treated for bruises and cuts. Police say 14 cars were involved altogether. The luxury cars were all in one place because they were being driven by a group of automobile enthusiasts on their way to nearby Hiroshima.